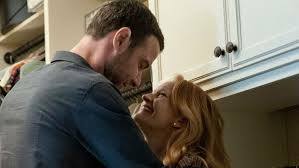 If you are a fan of the hit Showtime series, Ray Donovan, than you’ll appreciate this week’s Love Essentially, published in the Chicago Tribune Pioneer press, about the Donovan’s marriage, and how even through infidelity they find a way to stay together. Marriage isn’t easy. Just ask Ray and Abby Donovan. The married couple and main characters on the hit Showtime series, “Ray Donovan,” have had their share of problems. Ray’s haunting past, his “fixer” job that has him coming home beaten up and with blood on his suit multiple times a week, and of course, his flings with other women don’t make for a blissful marriage. That said, Abby isn’t the easiest of spouses either. Ever-suspicious and hot-tempered, Abby had a heavy affair with a police detective in season two, and in season three, she kissed Ray’s brother! The Donovans are the subject of this week’s column because, in last Sunday night’s season four finale, Abby said something to her husband that drives home the couple’s loyalty through thick and thin (and cheating). “Nothing can touch us,” said Abby to Ray at the end of the show, with conviction in both her whisper and her smile. It got me thinking: What separates couples like the Donovans, who stay together after cheating, and couples who end up divorced? And what is it that sustains longevity in a relationship? To get answers, I reached out to Dr. Anne Brennan Malec, a licensed marriage and family therapist and licensed clinical psychologist, who has a specialty in couple’s therapy. Malec said infidelity is what often brings couples into her office, and her approach to therapy starts with details of the affair. She said the spouse who has been cheated on can experience post-traumatic stress disorder and be greatly affected for a long time. Therefore, the spouse who cheated has to be willing to tolerate questions, often the same questions, over and over again. When asked why couples cheat, Malec said most likely there is something missing in the marriage. When asked what the biggest difference is in couples who stay together after infidelity and those who choose to part ways, Malec said it comes down to the unfaithful partner. He or she has to take complete responsibility for the behavior, not blame the spouse for his or her actions, and be patient with the repair process. She said other factors that come into play include: whether the affair was a one-night stand or a long-term relationship, whether or not the cheating spouse has apologized and is asking for forgiveness, and whether or not both people want it to work out. Malec said she encourages couples not to take any action, (i.e. moving out, separating, filing for divorce) for 90 days after they find out about a cheating spouse. What about couples who decide to stay, even though cheating is repeated behavior? In the case of the Donavans, it drives her crazy, but Abby seems to sadly accept Ray’s more than occasional indiscretions, choosing to stay together versus breaking up. So, does staying with a cheater mean it’s true love? Or do people tolerate infidelity because the good outweighs the cheating? Maybe the person is scared to be without the spouse or to be alone. Or maybe they view staying as their best option. Hmmm…never watched this show before. That being said in my opinion staying with a cheater does not show love.